Tradition and innovation – in combination these virtues build a solid foundation for international business success. Tradition instils customer trust and innovation makes customers eager to learn about new developments – just what it takes to build a solid business model. In addition, quality products, reliable service, and respect for employees and the environment are important building blocks of lasting business success. This structure must be sheltered by a good roof: an extensive dealer network that can act in synergy with global e-commerce. For over 90 years PICARD Lederwaren GmbH & Co. KG has built its business on precisely these principles. In 1928 bagmaker Martin Picard already had appealing designs to offer when he took his first collection by bicycle to the city of Offenbach, which was then a mecca for leather products in Germany. Picard’s approach was to build his brand step-by-step – mile by mile – and the effort paid off: In 1949 PICARD established one of the postwar period’s most modern facilities for manufacturing leather goods in the town of Obersthausen. By the end of the 1960s, PICARD had over 1000 employees. But the collapse of the textile and fashion industry in the 1970s as a result of low-cost products from Asia also hit PICARD. Unlike many of its competitors, the Picard family did not ignore problem, and instead went international, but without sacrificing its principles or valued image. Today PICARD employs about 1800 people throughout the world; coordination, testing, and planning continue to be carried out in Germany. The webshop that was launched in 2012 makes an important contribution to the company’s global business. But that’s not all: This family-owned business continues to build upon its local dealers. It’s a far-sighted approach that is unusual in an era in which e-commerce posts new sales records year after year. This is precisely what it takes to appeal to PICARD’s clientele. How the product feels when held and carried, the message radiated by its outstanding workmanship, and the luxurious accessories that might complement it are all things the customer wants to savour in person before making a purchase. It would be interesting to know just how many purchasers make their decisions to buy based on the sensuous aroma of a naturally dyed leather bag or the feel of a silky soft nappa leather purse. Such customers probably account for a significant share of the sales of the Obertshausen firm. But this sensual side certainly is no substitute for the global reach of e-commerce. Meanwhile e-commerce continues to undermine brick-and-mortar retailers. So are flourishing e-commerce and the growth of local retail business mutually exclusive? No, thanks to collaboration with the Karlsruhe, Germany company gaxsys GmbH. Using the gax-System, PICARD balances international online trade and support for its local retailers, both in varied multi-brand stores in pedestrian shopping zones and among franchisees who present PICARD at tourist hotspots. If an order is received in PICARD’s global online shop, in most cases it is not fulfilled by PICARD itself, but rather it is forwarded via the gax order processing system to participating local merchants. The first merchant who has the ordered merchandise in stock accepts the order and sends the product to the consumer. The system takes the distance between the consumer and the merchant into account, so that the merchants who are closest to the buyer are queried first, ensuring that the shortest possible delivery route is used. Working together with the middleware “CommerceEngine” from eFulfilment, which PICARD uses for its global order processing, the gax-System provides the interface for integration with the local merchants. CommerceEngine is used to decide whether an order is passed on to the retail exchange, or whether it is fulfilled by PICARD itself. In the latter case, the logistics processes are taken over by a third-party logistics company whose operations are automatically guided by the systems. If the order is to be fulfilled by the retail exchange, the gax-System handles distribution to the retailers. In this process, a territory protection feature can be provided, which is particularly important in the case of franchising. 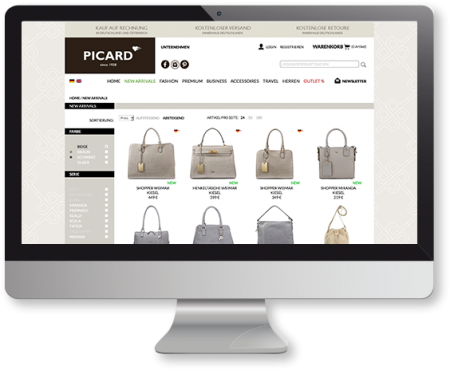 “For our PICARD brand webshop we felt it was important to find an e-commerce solution that would allow our merchants to participate in PICARD online sales easily and reliably without themselves having to develop an elaborate system. The gax-System was the right choice. So our customers and we ourselves are very satisfied,” explains Georg PICARD, CEO, PICARD Lederwaren GmbH & Co. KG. The customer gets fast delivery, the merchant maximizes the profitability of its floorspace, and PICARD gets decentralized storage for e-commerce. In addition, regional surpluses can be reduced by systematically coordinating orders or giving priority to specific local branch stores. By using retailer codes, the seller in the store has the ability to fulfil the order if the customer was not yet ready to buy in the store but later buys in the webshop. In this way the important showroom function that the retail shops perform is actively supported by the brand. PICARD is also giving something back to the retailers who, from very beginning, played such a big role in the brand’s success. The respect for tradition established by the founder is still very much alive at PICARD.